When it comes to meat, poultry and seafood, processors are faced with numerous challenges that begin with flavor and trend fulfillment -- consumers want food that's tasty and exciting -- and end with safe-food practices and packaging. Commodity meat, poultry and seafood have seen drastic changes in production methods over the past few decades. Increasing demand for plentiful and inexpensive products has forced much of the production away from the family ranch or farm and toward large factory-like facilities with all the problems associated with size and speed. Yet the rush for speed, volume and competitive pricing created some high-profile food safety lapses, which ushered in major corrective paradigm shifts that forever changed the face of animal protein processing. Today a growing number of consumers are weighing cost against food sources that promise free-range, grass-fed and antibiotic-free environments and product. All of that affects consumer perception of the end product, giving quality and value a more complex meaning and putting safety paramount — where it should be. Even in stressed economic times, consumers are still focusing on taste and nutrition, according to Issac Wiesenfeld, president of Wise Organic Pastures, Brooklyn, N.Y., a family business devoted to supplying double-certified Kosher and organic poultry and meats. Consumer interest in Kosher meats is steadily growing due in no small part to the fact that Kosher laws are stricter than USDA standards with regard to the health of animals that can be eaten. The laws strictly dictate how the animals are fed, killed and processed. "I would say in the protein category the demand for Kosher foods is growing at 5 to 7 percent annually," says Wiesenfeld. Wiesenfeld also sees more growth in the "natural" product category, although "customers are waiting to see USDA legislation on defining the ‘natural' claim," he says. At the forefront of this natural movement is the Niman Ranch, Alameda, Calif. In meat, poultry and seafood, as in most other food categories, the future seems to be about convenience, smaller portions, individually packaged products, ready to cook/heat meals and more eclectic flavor trends, says Hilary Burroughs, manager of marketing services for Sanderson Farms. Also as in other categories, there is pressure to preserve freshness naturally. "Use of preservatives is becoming less and less legitimate, and producers are seeking ways to continue providing fresh and healthy products with long shelf-life," says Oded Shtemer, president/CEO of Hefestus Ltd., Caesarea Industrial Park North, Israel. Hefestus is a developer of modified atmosphere packaging (MAP), which replaces oxygen with other gases that maintain the integrity of the food. "The SLB [Shelf Life Booster] technology enables the extension of shelf-life in meat, poultry and fish products without preservatives, while maintaining the delicate texture of the products as well as esthetic and appealing visibility on display," adds Shtemer. "SLB technology offers producers the ultimate solution for maintaining the delicate texture of products." From an 11-acre ranch in a small coastal town north of San Francisco, the Niman Ranch has grown to include more than 650 independent American farmers and ranchers united by traditional humane husbandry methods. Whether raising hogs, beef or lamb, these traditional farmers share Niman Ranch's dedication to the strictest animal husbandry practices and the belief that all-natural, humane and sustainable methods consistently produce the highest quality, best tasting meats. "We go beyond the USDA definition of natural — minimally processed, no artificial ingredients — because we believe natural should also mean the animals have been raised humanely, without antibiotics or added hormones and fed an all-natural vegetarian diet," says Jeff Tripician, Niman's chief marketing officer. "At Niman Ranch, ‘naturally raised' isn't a trend. It's been our business and our passion for more than 30 years. Our mission has remained steadfast: to raise livestock traditionally, humanely and sustainably." Natural also is part of the "quality equation" at Sanderson Farms. So are taste, nutrition, price, safety, convenience, according to Hilary Burroughs, manager of marketing services for the Laurel, Miss., producer of all-natural chickens. At Sanderson the term "all-natural" excludes injection of chickens with salt water, a process called "plumping," even though the FDA allows "enhanced" chickens to be labeled "100 percent natural." So must all meat and poultry be produced in free-range, grass-fed, antibiotic-free environments? "When consumers are asked about [those kinds of] offerings, they are very interested. However, the cost of these products eliminates many consumers from purchasing it," says Burroughs. "It's challenging in that this type of farming will decrease the amount of protein processed, because you cannot treat ailing animals with antibiotics. And free-range animals are more susceptible to bacterial infections and predators. "Our food supply would decrease tremendously if all farming practices were to be of this format," adds Burroughs. "There is a market for these items and a consumer willing to pay for them, however the growth rate seems to be miniscule. Consumers are still confused as to what these labels actually mean in terms of how the animal was raised, what they were or were not fed and how it affects the consumers' health, if at all." "Naturalness" and meat brings out the irony in salt. "Salt is one of the few ‘clean' things on the label," says Janice Johnson, applications leader at Wayzata, Minn.-based Cargill Inc.. Cargill is both an ingredient supplier and one of the country's biggest processors of meat. In addition to contributing its own flavor, "Salt contributes a nice flavor enhancement to other ingredients in the product," she continues. "Salt has been very important in the preservation of meats and keeping microorganisms in check, so the preservative aspect has to be addressed. Salt also increases the binding of meat. These solubilized proteins help increase the yield and keep the particles of the meat sticking together and sticking of the fat as well." So when product developers try to remove salt and otherwise reduce sodium in meat products, they must keep an eye on other functional issues, she warns. "The future of meat, poultry and fish will be complicated by the challenges of the new issues in the arena of animal welfare," says Joe Regenstein, professor of food science and head of the Cornell Kosher and Halal Food Initiative. "Animal welfare, sustainability, the environment and similar issues are on a collision course with consumer perceptions of what they think is best. It is clear the different flesh-food products have different carbon footprints, and this has important long-term implications for the balance between the various commodities, as more life-cycle analyses are presented. "Unfortunately some of these show that beef does not compete well," continues Regenstein. "At the same time, many of the issues that consumers — typically middle- and upper-middle class consumers — are most concerned about are issues that significantly raise the price of animal products without necessarily providing the benefits the consumer thinks are presented." According to Regenstein, such "good thinking" is counterintuitive to that which most of us assume at first glance. This disconnect seems to be widening between consumers and the reality of modern agriculture, although the animal agricultural industry finally seems to be trying to address this divide by becoming more active in the public arena. But this catches the processor in the middle. Regenstein notes that recent work by Jude Capper, assistant professor of dairy science at Washington State University, Pullman, Wash., shows that the lowest carbon footprint comes from grass-fed beef that's been finished off with high energy rations. "This is an example of how good analyses can give counterintuitive answers." The consumer wants the same quality from the sea as from the land. "In the past 10 years, a trend toward buying local and sustainable seafood seems to have caught on," says Wayne Heikkila, executive director of the Western Fishboat Owners Assn. (WFOA), Redding, Calif.
"Regional fish promoted as such — Copper River king salmon, California king salmon — have been very successful and prove consumers are willing to pay more for local, sustainably produced products," he says. Consumers view wild-caught fish as a natural counterpart to free-range animals. "The demand for wild-caught fish is growing slowly but steadily," says Heikkila. "It's a matter of educating the consumer and getting local processors to make it available for the U.S. market. It is still easy for a processor to buy fish off a boat and put it into a container for a per-ton fee then send it halfway around the world. WFOA is educating the U.S. public to raise demand and make the U.S. market a viable option for U.S. fishermen, processors and the consumer." More and more locally fished albacore tuna is reaching consumers through retailers such as Whole Foods and others. It also is hitting shelves in value-added forms, not just cans. "Once consumers realize tuna can be eaten without being canned, they seem to like it and buy it," continues Heikkila. "It has better flavor, greater nutritional value such as high omega-3 content, while being a reasonably priced source of protein." Independent research has demonstrated that the smaller albacores caught by U.S. trollers based on the West Coast have lower mercury levels than the larger longline-caught albacore, along with higher levels of EPA and DHA omega-3 fatty acids. WFOA is dedicated to educating the public on the health and nutritional benefits of its sustainably caught product. Kwik Pak Fisheries, a community-based business formed by six local villages near the Yukon River near Anchorage, Alaska, takes wild caught and sustainable very seriously. After all, subsistence fishing has been the mainstay of the Yupik people for generations. Today, income derived from commercial fishing helps them to preserve their longstanding traditions. "Yukon River salmon is a very special fish," says Ruth Carter, Kwikpak Fisheries' marketing and sales manager. "Caught at the mouth of the Yukon River in preparation for its long journey to the spawning grounds, Yukon River salmon has the highest omega-3 content of any seafood found in USDA databases. In addition to its nutrition benefits, it tastes great." If there's a "hot fish" today, barramundi is it. National Geographic declared it "a farmed option that can save depleted species." Australis Aquaculture, Turners Falls, Mass., "began with a better idea," according to Carol Devine, vice president of marketing. Instead of simply farming a popular fish, they sought the perfect fish to fit sustainable farming. But it's not just any aquaculture set-up. Shunning the highly controversial outdoor pens and cages typically used by fish farms, Australis developed one of the world's largest and most ecologically friendly indoor recirculating systems to re-create barramundi's natural habitat. Environmental controls and specialized natural feed that contains no hormones, antibiotics or colorants ensures the healthfulness of barramundi and leaves them completely free of mercury, PCBs and other contaminants. Also, the barramundi's ability to synthesize omega-3 fatty acids from grain-based oils qualifies it for FDA's highest nutritional designation as an "excellent source" of omega-3 oils. It's hard to discuss meat, poultry and seafood processing without considering extenders, specifically soy. "Where food technology can allow it, adding soy proteins to meat products can make them affordable without compromising on quality," says Eran Shani, regional marketing manager for Asia, the Pacific, Africa and the Middle East for Solbar, Oakdale, Minn.
"Solbar has developed soy products to specifically provide texture, protein and functionality, allowing them to replace meat with equally good quality protein while binding water, or water and fat, where necessary," he says. "Solbar's textured products also can absorb and retain flavors with either water or brine. The amino acid score — meaning the protein's food value to the human diet — of our products is nearly 100 percent," he adds. 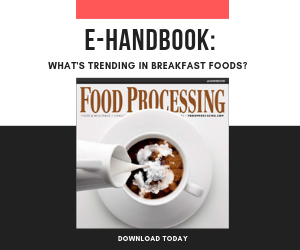 As the protein market changes to accommodate economy and intensified consumer scrutiny, suppliers must step up to the plate literally and figuratively to hone their technological know-how to meet those meaty challenges. "In the short term, processors are going to have to provide products that might violate some of the best science and what is best for the environment," says Cornell's Regenstein. "But in the long term, consumers are going to need to be taught more about modern agriculture and its benefits, and why certain practices make sense."